I could use your help here, because I'm stuck with something. I'm sure I've mentioned before, but I'm an editor on Wikipedia. I was fully aware that the representation of Grands Prix in the United States was a complete shambles so I'd had it on my "to-do" list to fix. I've recently fixed the mentions of "United States Grand Prix East" to point to "Detroit Grand Prix" and have done the same with Dallas and Caesars Palace. I was just about to fix Long Beach but I got an objection from someone to the changes. I'll summarise the conversation. Him : These changes are wrong! Look at all these sources! Me : No, these were the races official names. Look at the official programme covers. Him : I don't trust those. Look at formula1.com! Look at grandprix.com! They all say US Grand Prix West and US Grand Prix East. Me : This is a falsehood that has been repeated ad verbatim. There never was a West or East Grand Prix. There was a Long Beach Grand Prix, a Detroit Grand Prix, a Dallas Grand Prix, a Caesars Palace Grand Prix and a United States Grand Prix. So how am I supposed to sort this out if several high profile sources (including the official F1 website!) are entirely wrong over the race names? I'm all for using reliable sources, but if said source is wrong, surely it's our duty to give the correct information? How can I win this argument? Also, where have these names come from? How are they on the F1 website? I cannot speak for now, but when I worked at FOM (who run the Formula One.com site) ALL results, event titles, entrys etc, came from the FIA archive. I don't currently have access to my data base, built from the same FIA documents and records, but can check December 20th by which time I will be home, but I'd always go with the FIA records, they after all run/ran it, if albeit under different guises. Having said that, some events had sub-titles to the event name, and therein lies your problem! I think we've got USGP East/West on the LAT archive and in Forix, both of which are fairly reliable but by no means the final word. Sorry, for taking a contrary position, I have to support Rob on this one. In case of doubt I would always trust the primary sources as long as the secondary sources don´t name their sources or deliver an explanation how they came to their position. http://www.formula1....r/1954/565.html - Never a BMW engine in that car! I think also a problem of a website like this is, that it is constructed totally from a today´s point of view, disregarding how Grand Prix racing has changed over the decades. As an example today there is no difference anymore between "team" and "constructor", but to list Rudi Fischer as member of the Ferrari team http://www.formula1....r/1952/519.html without any further comment is certainly misleading. Regarding the authority of an "official" website it will be very problematic to argue against somebody, who does not know too much about the background, that he was a privateer: "But the official Formula 1 website tells..."
Forix has United States, Dallas, Detroit, Las Vegas and Long Beach. I vividly remember the races being touted as the USGP East & USGP West in virtually all the period race magazines that I read religiously. My recollection is slightly different. I recall Long Beach as being referred to as the USGPW, but Watkins Glen remained THE USGP. Further, it seems that calling Long Beach USGPW was, at the time, more of a convenience than an official name. But, bear in mind, I am going on recollection here, not on any reference to records. I fully expect to be rebutted on this, but it is just the way I viewed it back then. I was (am?) of the old school that said there could only be only ONE Grande Epreuve (another old school term) per country per year. Hence, Pescara GP, Luxemburg GP, Swiss GP, Pacific GP, European GP, San Marino GP, etc. The US had Long Beach, Caesar's Palace, etc. After Long Beach and Dallas went away in the mid 80s it seems that Detroit, and later Phoenix, became known as the USGP, and as they were the only Grande Eprueves (there is that old term again) in the US, so they were. But I imagine that it is all a matter of semantics anyway. Tom - I may very well be "recollection challenged". It certainly wouldn't be my debut on being so! Anyway, Formula One seems to be okay with the designations on their website. Even after saying they Formula1.com used the FIA database, that example indicates that they might not be. The database I built had the team and Lotus-Ford isn't a team! Weren't they John Player Team Lotus? 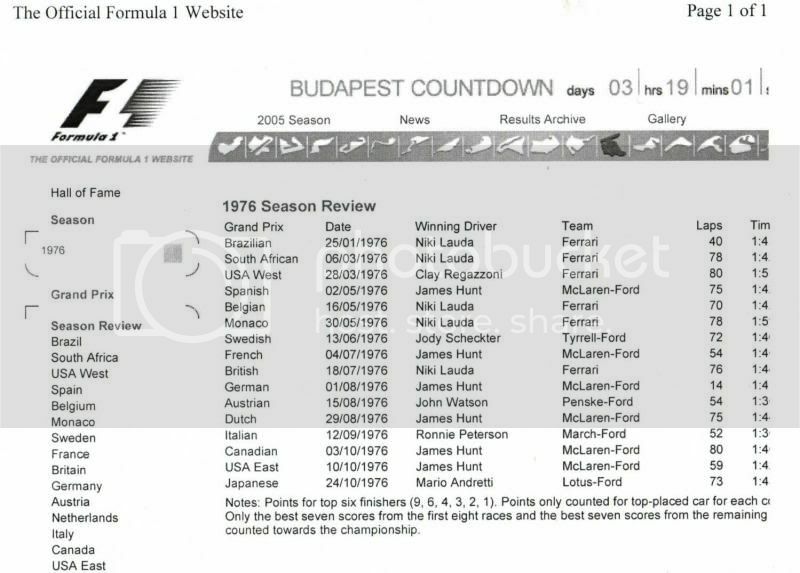 And again the database I worked on would have said Lotus Ford 77, and where possible, the chassis number, so I would say now, Formula1.coms website appears to be using a dumbed down, basic, and possibly incorrect database. Can I withdrawn my earlier statement, and just say the FIA!!!!?? But that would be correct using the current results system that they'd display on screen had that race run two weeks ago. ISTR that there was 'Jaguar-Cosworth' at one point. Hi, I don't know if this helps, but I have an original poster for the 1976 Long Beach race. The race is advertised in bold letters as the "United States Grand Prix West". Can someone mail Chris Pook? Is it like the 1976 programme - on this page? It's clear that only 1976 calls it the United States Grand Prix West and all the others say either Long Beach Grand Prix or Grand Prix of Long Beach. Wait for Don Capps to join in. The "USGP West" moniker was a marketing tool in 1976, the event being actually the II Long Beach Grand Prix. However, as is sometimes the case, why let facts get in the way of what people want to believe? One solution would be to list each event under its official name, with the "popular" name in parentheses (aka USGP West) or in a footnote. Surely it's all pose and grandstanding? "We only deal with countries, no little town or city is a part of our World Championship!" As usual, I will go along with what Col Capps says. At the time, even I who had little interest in the officialness of such terms or if there was any significance over the arc of history as to the designations, knew the "West" and "East" were colloquialisms, used at the whim of and at the convenience of promoters and other such dabblers. I have great respect for Wikipedia editors, or Editors if they prefer. Same kind of respect I have for any self-appointed "authority": they, like Olympic athletes and F1 drivers, are freakish in their obsession, and are admirable, but subject to evaluation on a case-by-case basis. Seems as if the objector in the conversation set out above is probably wrong in accepting published "facts" without support from references focused on accurate source material. Kind of difficult, persuading a believer that his "Bible" is based on story-telling rather than valid historical records. I know, fairly tricky isn't it? I think the argument is going my way, but I've had to produce programmes, posters, ticket stubs and other articles. I just want accuracy. The problem with Wikipedia is that certain quarters see it as inaccurate. I don't have a problem with that. If I'd have seen the US Grand Prix page for the first time, I would agree. The only way we can change that is via means like this - challenge the common myths and make the site seem accurate when seen by the specialists in various areas. I hope I can go some way to improve the motorsport side of things anyway. If Wikipedia is accurate then hopefully the hundreds of other websites that nab information from it can be accurate as well. "US GP West - Long Beach"
"GP USA - Watkins Glen"
The dashes for these (and other races) separate the event from the venue, as in "GP Great Britain - Brands Hatch" and "GP Deutschland - Nürburgring"
'76 says US GP West on the programme, however it's the only year that does. All the others have "Long Beach Grand Prix". Do you happen to have the 1977 yearbook? If so, would you mind checking? The problem really seems to be a single year, 1976, since the "Long Beach Grand Prix" title was used more often in subsequent years than the "USGP West" title. The retrospective confusion and differences of opinion and fact on this probably reflects an inverse relationship to its actual importance, of course. To write that the marketing effort to make the Long Beach race known as the "United States Grand Prix West" was a success would be to indulge in understatement. That we are even having a discussion concerning what the actual title of the race might or might not be is a sign of just how successful it was. When I examined the local Long Beach papers to see what they called the 1976 race, it was often the "Long Beach Grand Prix," but sometimes the "United States Grand Prix West," generally depending on who was doing the talking. Chris Pook seems to be either the origin of -- or quickly picked up on the use of, the "United States Grand Prix West" moniker to market the Long Beach event. Again, his marketing success is evident. After looking at the program covers, the various Yellow Books, the local papers, the various Comics, and various and sundry other materials, it would seem that even if the official title of the race was "II Long Beach Grand Prix" -- which it probably was, it would also irrelevant since it is indelibly etched in the minds of so many as the "United States Grand Prix West." Or, perhaps, the "United States Grand Prix -- West." Will the tides cease their ebbs and flows or the stars disappear from the sky if the race is referred by its incorrect title? I doubt it. Outside of only a few dozen people at the very most, does anyone really care what the correct title of the race was? Once again, I must express great doubt. In my own mind, as diminished and inadequate as it might be these days, I am convinced that the 1976 event was the "II Long Beach Grand Prix." However, as my great boss at DARPA, Dr./COL Steve Funk, used to remind me, "Being right is often irrelevant." The problem really seems to be a single year, 1976, since the "Long Beach Grand Prix" title was used more After looking at the program covers, the various Yellow Books, the local papers, the various Comics, and various and sundry other materials, it would seem that even if the official title of the race was "II Long Beach Grand Prix" -- which it probably was, it would also irrelevant since it is indelibly etched in the minds of so many as the "United States Grand Prix West." Or, perhaps, the "United States Grand Prix -- West." How might we find out the official title? Is there anywhere it might be listed? FIA year book as quoted here is your best bet-thought I prefer that used by the organizer at the the time.A problem not confined to the USA.Every record I have seen refers to 1976 F1 race at Fuji as the 'Japanese Grand Prix' however the banner on the podium says 'F1 race in Japan' plus some japanese lettering that I have yet to translate but guess means the same? Races in Argentina had had there names changed with changes in government. The FIA Yearbook will have listed the event as it was described by the applicant-I assume in each case ACCUS. So I agree with previous and later posters the name which was given the event by the appklicant canot be wrong -regardless of what it was either subsequently called, known or sold as. You are searching for a "truth" that doesn't exist. The race has different names in different contexts. And was called different things by different people. And different things in different years. Real life events can't always have a pattern superimposed on them. I'd suggest you use a page title that is going to fit your needs best and that might well be "US GP West (Long Beach)". Accept Allen's recommendation and move on. Since not one soul really cares outside of you and maybe three or four others and there is virtually no one who knows enough to even raise a peep about it, just say, "Next!" since it does not matter. If you are actually wrong, who would know? Who would care? Maybe three or four people in the entire world at most? I doubt that Chris Pook even knows anymore. Nor do I think that it is of any importance to him since the "USGP West" is what he wanted to be known as for obvious reasons. Once upon a time I may have cared enough to continue being a drudge about it, but not anymore. I know what I know and that is enough for me. Since it looks as if I am going back to the desert soon, it is probably safe to say that this is not something I will be sitting around fretting about in the meantime. It seems the USGP West is one of those contentious issues. When the programmes and tickets (bar one year) all say Long Beach Grand Prix, I'd tend to go with that. However, it seems that journalists (and the FIA) have recorded it differently. Despite all this, I can be certain of several things. There was no USGP East, be it in Watkins Glen or Detroit. There was no Las Vegas Grand Prix, but there was a Caesars Palace Grand Prix. There was no United States Grand Prix in 1984 - there was a Detroit Grand Prix and a Dallas Grand Prix. These things I have managed to correct. I just wonder if now is the right time to breach the subject of the United States Grand Prix at Meadowlands! Rob, I support you. These questions worth caring for them. More you really know, more you can then ignore. As far as I know only 1976 edition of Long Beach race had "US Grand Prix West" title. All other races were Long Beach Grands Prix. Rob, you do us a disservice by not providing a link to the origianal argument. For those of us who steadfastly avoid wikipedia, but can't remember exactly why, this serves as a handy reminder. "Since it looks as if I am going back to the desert soon"
I didn't include the link because I didn't think it was fair on the other participant - after all, everyone has a right to express a valid opinion. For what it's worth, I think there are a lot of wonderful and admirable things about Wikipedia. The idea that knowledge should be free to all. The idea that anyone can contribute their knowledge for others to enjoy. I believe in these ideals and as such I contribute what I can. If this means challenging sources from well known authors and trusted sources, then I feel it is important so that romantic myths from raconteurs are eliminated and accurate versions of events can be offered. To Don - best wishes for your forthcoming trip. Stay safe. ... and a good laugh was had, thanks! What worries me after reading the discussion is how the debate can be dominated by one person reiterating his opinion ad nauseum and wearing everyone down. That particular person also worried me by only being willing to consider website content and unwilling to accept contemporary paper.